AMD is today launching four performance Ryzen chips for the desktop market. Known by the codename Pinnacle Ridge and built on the Zen+ architecture, the Ryzen 7 2700X, Ryzen 7 2700, Ryzen 5 2600X and Ryzen 5 2600 look to set new performance standards. It is instructive to head on over to the original Ryzen 7 1800X review in order to understand and appreciate the underlying architecture because 2nd Generation Ryzen incrementally builds on top of it. We'll explain what is new in 2nd Generation Ryzen as we move along this review, but first and in keeping with how we do things, let's roll out the Table of Ryzen™. There are no major surprises here. AMD's remit with Pinnacle Ridge is to find extra performance via multiple avenues available a year after the initial launch. Increasing the core base and boost frequency is one obvious method, evidenced by the four new chips operating at higher speeds than the previous generation. AMD has been able to achieve higher sustained clocks by using two methods: a move to a 12nm LP process from GlobalFoundries and adoption of Precision Boost 2 - we will talk more about both in a while. Core frequency gains are the largest performance differentiator if the base architecture remains largely the same, of course, yet adding faster memory support can also be deemed useful in most circumstances, and thus the move to DDR4-2,933 is predictable. AMD has also reworked the cache and DRAM latencies to offer nippier access for latency-sensitive tasks. In sum, the firm has grabbed the medium-hanging fruit that was left on the table in the drive to release the initial Ryzen chips in March last year. These improvements are expected and welcome from a performance and power perspective. 14nm didn't last long for AMD, did it? Though the firm remains tight-lipped into the exact secret sauce behind this variant of 12nm - how is the front-end-of-the-line and back-end-of-the-line configured, for example - what we do know is the chip isn't meaningfully smaller than first-generation Ryzen; both come in at around 210mm² and carry 4.8-4.9bn transistors. So if it's not fundamentally smaller, leading to lower manufacturing costs, what's the point? Good question. The answer lies with how 12nm LP (Leading Edge, not Low Power) scales with voltage. According to AMD, 12nm enables the transistors to run faster at the same voltage, thereby offering 10-15 per cent performance uplift compared to 14nm across the clock spectrum. Putting it another way, 12nm needs less voltage to hit the same frequency - about 50mV less, typically - which can be repurposed into boosting clocks or simply reducing chip power at a given frequency. Let's look at both with numerical reference points. AMD says that 12nm enables an additional 200-300MHz frequency headroom when under full gas at the same TDP, leading to potentially 15 per cent more perf than what was available previously. Or, if you prefer, there's an 11 per cent power reduction if running at the same frequency. This is the 'free' part of moving to 12nm, even if there is no die-area/cost savings from a nominal shrink. We cannot talk about frequencies without referencing Precision Boost 2; the two are inextricably linked. The Ryzen 1000-series chips use the original Precision Boost that takes frequency, power, temperature and usage into account to grab unused frequency headroom for each processor - the gravy, if you will. The problem with the original is that the highest frequency hike only applies to two cores. Running applications on three to eight cores results in the same automatically lower boost clock (known as all-core boost), even if there isn't huge load on the chip; the speed of four active cores is largely the same as, say, eight. It is a crude but effective way of getting something for free. We say crude because it sets frequency by cores and threads rather than workloads and environmental conditions. The chip could probably run faster on all cores, but Precision Boost's coarse boosting doesn't allow it to do so. Precision Boost 2, on the other hand, keeps the frequency as high as possible, for as long as possible (given environmental conditions), on as many cores as possible. Its aim is to keep going until it hits a voltage, current, frequency or thermal limit, without caring about how many threads are being used. Put simply, the chip ignores pre-defined speeds and goes as hard as permitted. One should expect an eight-core, 16-thread chip to boost higher than first-gen processors in situations where more and more threads are tasked with work, with PB2 making educated guesses as to how close it can run to the ceiling. Got a great cooler? PB2 ought to let the chip run faster. Got excellent ambient temps? Same result. 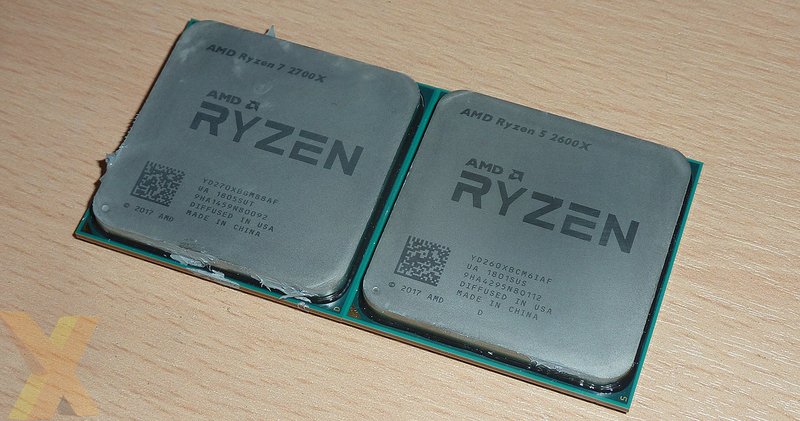 The bottom line is that you can expect to see every 2000-series Ryzen hit closer to its peak speeds more often, almost irrespective of cores and threads, assuming you have good cooling in place. And those peak speeds are already higher due to the 12nm process. Kind of a win-win situation, right? A year is a long time in the microprocessor world. There's a heap of stuff that just cannot be grabbed when the initial chip needs to be taped out. AMD's Joe Macri explained that one clear, obvious improvement available to the 2000-series Ryzen lay with memory-latency tuning across the chip. Improving these, Macri said, would enable Ryzen to offer greater IPC and become a (slightly) better gaming chip. Without delving into the microarchitecture knobs and whistles, a good, hard look at the Zen core revealed that there was opportunity for a lot of 'tightening up,' as he put it. The result of engineers tinkering with the data caches has led to a 13 per cent improvement in L1 cache latency, 34 per cent for L2, 16 per cent for L3, and 11 per cent for DRAM latency. Those are solid, impressive numbers, but let's not forget first-gen Ryzen was mediocre in the latency stakes, well behind Intel's 8th Gen Core. It is this across-the-chip latency improvement that gives Zen+ a three per cent IPC hike over the previous generation. Getting data through to the engine as quickly and seamlessly as possible enables the cores to do more work each clock cycle, hence that better IPC. And if you factor in a higher core frequency, not only is Zen+ a little bit more efficient at most work, it goes faster. AMD took the pricing cleaver to a number of first-gen chips in January. The firm continues to be aggressive with the quartet of new processors. The Ryzen 7 2700X is retailing for $329 (£299) and is a direct replacement for both the Ryzen 7 1800X and 1700X, as well as the new pricing competitor to the Intel Core i7-8700K. The new technology, discussed above, enables AMD to push the Turbo clock to a maximum out-of-the-box 4.3GHz, but given what we know about how Precision Boost 2 works, we expect the all-core clock to be over 4GHz with good cooling. That figure ought to give it a 10 per cent-plus lead over the Ryzen 7 1800X which typically all-core boosts to around 3.65GHz. That said, letting the chip run higher means the rated TDP jumps to 105W. 2700X also ships with a new-and-improved heatsink known as the Wraith Prism. Now outfitted with configurable LEDs and better cooling, it is said to rival the performance of $50 standalone models. Ryzen 7 2700, meanwhile, scales back the TDP to 65W and carries on the good work laid down by the 1700. The big difference this time is the pricing, which is so close to the 2700X that it doesn't make sense for the enthusiast. If you remember, first-gen 1700 was originally significantly cheaper than 1800X. Ryzen 5 2600X and 2600 follow a similar tack. Both offer an additional 10-15 per cent performance in an all-core state compared to first-gen models. Price points are a touch higher, and the 2600 will have a hard time in looking attractive against the Ryzen 5 1600 that's currently available for a bargain £140. Of course, we expect first-gen models to disappear in due time. Last but not least, getting the most out of these new chips means AMD is releasing a new performance chipset, the X470, and you can read about it over here. In a nutshell, AMD is offering 10 per cent-plus more all-core performance and incrementally better gaming performance for roughly the same financial outlay as first-gen models. Is that good enough to stave off the Intel 8th Gen Core threat? Let's find out.